Co-creation is often paid lip service - most think they're doing it and aren't or don't realise why they should. Simple, repeatable processes that identify and drive the right habits and culture are needed alongside social technologies for collaboration and transparency. Shared value is realised through co-creation amongst empowered stakeholders. In many organisations, management are still generally the ones who decide on major changes in strategy, process, product lines, services, etc. Sufficient input from key stakeholders is rarely sought making the change or new product/service or process non-representative and buy-in only comes after the fact, if at all. This can apply in any setting where one entity is empowered to make a change for another entity. This creates issues around both the quality of and the buy-in for the change/product/service (the solution) or even consensus of how to implement it. More damaging is that the arrived at solution may not be the best approach. The real problem however, is that often the allocated resources were committed to and spent before the solution was validated. A simple, unbureaucratic, speedy and cost effective methodology is required where important changes in strategy, process, product line or service requires key stakeholder analysis to be conducted and the key stakeholders have to be involved in evolving the solution and be incorporated in the decision making before moving forward. It will ensure that whatever solution is decided on has been co-created and there is a greater chance that the new implementation will be fit for purpose and will be adopted positively by the stakeholder group. Stakeholders can be employees, managers, customers, partners and suppliers. Measures for the success of the implementation should be determined by the stakeholders. External facilitators of the process would work much better than if this was handled by a representative of any one stakeholder group as the latter may introduce bias. It's important in a co-creation situation that everyone's views have equal value and in the beginning it may be difficult for participants to get away from learned hierachical behaviour. An applicability test could also be carried out to make sure co-creation is being carried out fairly and to nullify any biases that might occur. To do this we could simply have voting functions built into the software supporting the efforts that allow for various decisions or discussion points to be rated or ranked by individuals. Further to the last point, social technologies that serve to raise visibility and transparency and allow for activities to be tracked is fundamental in support of any initiative. The practical impact would be in better outcomes or improved performance directly related to co-creation efforts. Intuitively, you can see how including stakeholders in the process of creating a solution will better inform that solution. You also need to get stakeholders in the habit of co-creation. The challenge is in facilitating the co-creation process. Changing the process starts with attitude and introducing new ways of thinking and working. If you can demonstrate that co-creation utilizes resources more effectively and the resulting solutions perform better you will go a long way in changing attitudes. If successful just one defined and implemented solution which has been co-created will demonstrate the value of this approach in terms of how it develops the capabilities and thinking of the people who take part, the robustness of the solution and its ease of implementation and repeatability and the reduction of risk and cost effectiveness. It is likely also with just a handful of averted disasters from not understanding the needs of the recipients or drawing on their intelligence and knowledge this approach will become the default action to a change request. In fact future failures if they involve not including the correct parties in the creation process will likely receive little compassion from peers. Peer pressure is one of the strongest forms for change. 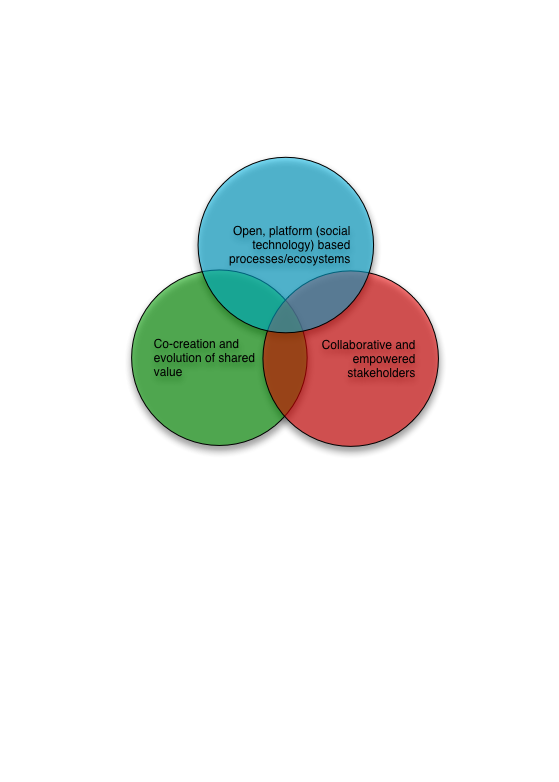 Finally, embedding co-creation processes and successes until they become habits could be greatly facilitated by social technologies which by nature make group efforts transparent and allow for knowledge to be stored and shared. Some great examples are given in this recent article on the Harvard Business Review entitled: The Wisdom of Your In-House Crowd. What is missing from the description of these examples are the kinds of repeatable processes described in the solution section. Two test groups should be set up where one has a change in a process (the simplest type of change that can be tested within the time constraints) imposed on them and the other is progressed as described above. The change is implemented and at the end the expectation is that the group who was consulted does better in managing the changed process.